Then he pointed to the hut and said. 'All the rooms at this end are empty; you can have anyone you like. The toilets and shower are through those doors; don't unload any more stuff than you need because there's no lock on the door. I'll try to find the duty officer and be back in half an hour with a footy registration form and I'll take you to the 'JAZZA' for tea.' (The Jazza was the Junior Staff Association Mess). I unpacked a few essentials from the car, had a quick shower, (even the cold water was hot), then lay on the bed in a pool of perspiration until Barry returned. I thought of Nancy, half a world away in Melbourne. It was painful but I couldn't keep her out of my thoughts for more than a few seconds. The following weekend we had planned to go with our friends from Y.H.A. to Philip Island to watch the Armstrong 500, which later became The Bathurst 1000, and I wondered if she would still go. Barry was as good as his word, arriving thirty minutes later with a football registration form and he took me to have my first meal at the Jazza, where I met some of the guys I would work with for the foreseeable future. Next morning I had been dressed and ready for half an hour when Warrant Officer Arthur Johnston came to pick me up and guide me through the administrative maze that seems to be part and parcel of all government organizations, particularly secret ones. The first thing he said was, 'What happened to your temporary pass?' 'I don't know anything about a pass,' I said. 'Nobody said anything to me about a bloody pass.' 'I don't know what's wrong with you RAEME (Royal Australian Electrical and Mechanical Engineers) blokes, but you should have been told to report to Cheswick Barracks in Adelaide and pick up a pass and the rest of the paper work, you're lucky they let you in. The last army guy who arrived here without a pass had to drive back to Adelaide to get it.' I thought to myself that if I was made to go back to Adelaide I would tum left and continue on to Melbourne. Our first stop was at security where the same questions were asked again, my photograph was taken and after a ten minute wait I was issued with the over due temporary pass. The real thing arrived by registered post a week later. I was reminded of the Commonwealth Secrets Act and the penalties for breaking the rules. Then we went to a store where I was given a set of blankets, sheets, and towels and a set of keys. Next stop was my room. It was in a very new two storied brick building of twenty four separate rooms. Mine was on the ground floor, next to the showers. It was like a small, well designed motel room with a good bed, a very nice innerspring mattress, a chair, a desk, a floor to ceiling wardrobe and a high shelf on one wall to support a fan. Without any doubt it was the best equipped room the army had ever given me. 'They must have hired a new interior decorator,' I thought. 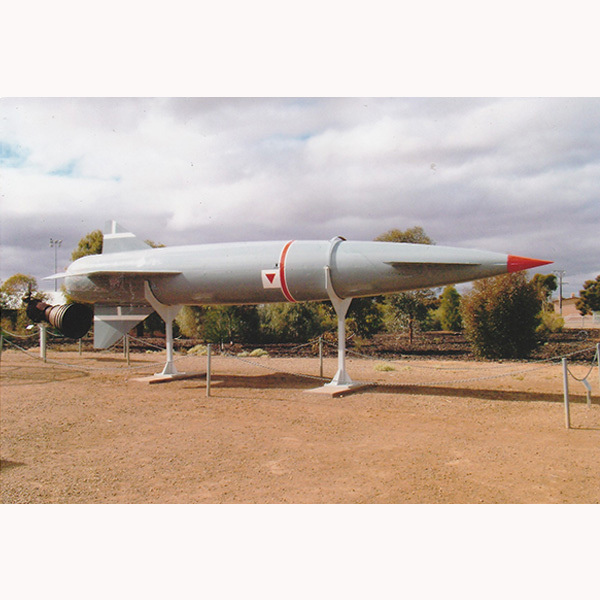 By any measure, Woomera was an unusual place. The town, or more correctly 'The Village,' was roughly square, being about a mile, one point six kilometres, along each side. The shopping centre was at the intersection of the two main roads which bisected the town, along with the swimming pool, cinema, schools, post office, two of the three churches and the forty four bed hospital. When I arrived there were only four hundred and ninety nine private houses for married couples which resulted in a long wait for new-comers and caused the separated families quite a lot of distress. The limit on the number of houses was caused by a Local Government by law which was later found to be invalid because all the land and everything on it belonged to the Federal Government and not subject to South Australian regulations; consequently one hundred more dwellings for married couples were immediately built to ease the problem. Most of the single men were housed in dormitory style huts, single level with timber walls and an iron roof, however all armed services personnel were accommodated in the very new two story brick buildings. Because the town was modelled on military lines there were three messes and all, including civilians, were required to belong to either the Officer's, (Senior Staff Mess), the Sergeant's, (Staff Mess) or The Jazza, (Junior Staff Mess). This rather artificial segregation was very difficult for some of the civilians to accept and resulted in a certain amount of snobbery, particularly among the wives, (And to what mess do you belong?) Single women, and there were very few, had their own Mess which was usually referred to as 'The Crumpet Farm.' (A very British term). The irony was that when the new Jazza was constructed it was by far the largest and best equipped of all. It featured a main bar which was one hundred feet (thirty metres) long, a billiard room with six full size tables, a small theatre, a room with six table tennis tables, a darts room, an indoor garden complete with two fresh water crocodiles, several meeting rooms, a shop and a huge dining room. The Woomera Board was a sort of Local Government who had responsibility for the beautification of the town and care of the sporting facilities, including the grassed oval. They had supervised the street planting of more than ten thousand native trees. Each had a surrounding earth dam and an earthen ware pipe sunk into the dirt which took water down to the roots. Every week a water tanker would deliver a dam full of second class water to each tree. This regular watering and the abundant sunshine resulted in their greatly accelerated growth and as a bonus, because the water contained hundreds of tomato seeds that had passed through the treatment plant unharmed, nearly every tree was surrounded by a tomato patch. When all the housekeeping details were completed we boarded the eleven o'clock bus for the forty five kilometre ride to 'Range E.' This was a journey I was to make almost every working day for the next seven and a half years, in total I travelled about one hundred and seventy eight thousand kilometres. Range E, or the Range Head as it was more generally known was where most of the interesting work took place and where security was most strict. In the five years that Nancy was there she did not once get to Range E. At the guard gate I was taken to meet the Senior Security Officer, an ex army man who as soon as he saw that I came from WA and had lived in Melbourne said, 'Do you play football?' After a short interrogation where I was again reminded that I was now subject to The Australian Official Secrets Act, my temporary pass was stamped with several large red letters which indicated the only areas I was permitted to visit. The army headquarters were located in a high, strangely shaped building, known as Test Shop Six, which was to be my work place for the next four years and was the location of the other RAEME guys. There were only about forty five personnel, mainly Artillery, in the whole unit. Launcher Development Organization). The first stage of this monster had started life as the 'Blue Streak' Britain's entry in the race to build an Inter Continental Ballistic Missile. The I.C.B.M. project was cancelled then reborn again a year or two later when ELDO was created. The plan was to use Blue Streak as the first stage, the French were to build the second stage, the Germans the third, the Italians the satellite and the Dutch built a couple of radar tracking stations. (And yes they were shaped like windmills). It was a recipe for disaster, guaranteed to fail and in my opinion much of the blame should rest with the French. There were also anti-tank missiles, delayed bomb drops, stand-off bombs, cruise missiles and a number of others. I was also at one of the camera sites which photographed the launch of Australia's own satellite, 'W.R.E.SAT.' The most exciting firings were the anti-aircraft missiles fitted with a warhead. On these occasions the missile would be programmed to intercept the aircraft and every radar set and camera was utilized. Some were required to track the missile from launch to impact, others to follow the aircraft till impact then the largest piece of debris for as long as possible. On these special occasions we used colour film. The Black Knight's rockets were fired late on moonless nights which meant that we were required to work long and very irregular hours. Naturally the civilians were paid rather well for their efforts but in the army we had to settle for an extra five days leave and five shillings and six pence per day. extra work meant that we needed more space, tools and equipment. So everything we needed was ordered, (there seemed to be no shortage of money) and within twelve months we had established a small but superbly equipped instrument workshop. One of our responsibilities was to maintain the navigational equipment on the fleet of specially equipped recovery vehicles, which were used to recover used missiles and crashed aircraft. To calibrate each vehicle, after a service, we needed to drive quite long distances through the scrub to accurately surveyed "trig points." In this way we were able to visit Kingoonya, Mt. Eba, Mirakata and some of the other interesting parts of the area. Another of the better jobs was to service the large video tape recorders in the 'Instrumentation Building,' which was the only brick and concrete, two level structure at Range E. The only tape recorders I had ever seen were the little quarter inch machines that people used as home entertainment so I felt it was quite a privilege to work on these half inch, fifteen inch diameter monsters. These new responsibilities were interesting and a great experience but our first priority was always the radar sets and optical trackers.